Memberships in loyalty programs are expanding rapidly while active participation in programs is falling. The reason is simple: Although the barriers to joining programs are lower than ever, most programs are undifferentiated and rely largely on discounts. Although spending on loyalty marketing is effective, marketers still heavily prioritize acquisition spending. One study found that slightly less than half of consumers remained loyal to a Top 100 US consumer packaged goods (CPG) brand over a one-year span. Consumers remain highly price conscious, but discounts aren’t enough to keep them loyal. According to one study, 63% of US millennials participate in a loyalty program that supports their lifestyles and personal preferences. 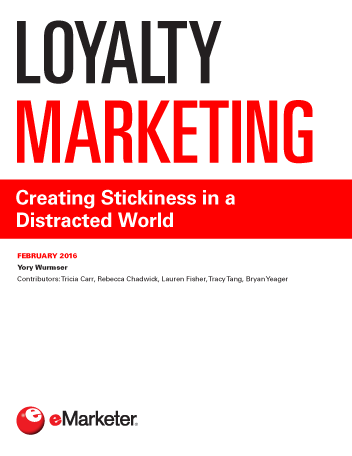 Loyalty program memberships in the US climbed to 3.32 billion in 2014, up 25.3% from 2012. Growth was strongest in drugstores and restaurants. Gamification is increasingly important in keeping loyalty marketing fresh. Mobile is changing loyalty marketing by raising expectations of instantaneity and consistency across channels. It has also opened up new opportunities in real-time messaging, customer service and seamless customer experiences. "Even as memberships in loyalty programs continue to increase, active participation in programs is decreasing. This points to a failure of many programs to engage members with relevant and differentiated offers and service."